Happy Friday everyone! I don’t know about you but this week felt like it lasted a month. There must be something to this Mercury-in-retrograde business. I am so ready for a relaxing weekend. I am really excited to bring you this post, we’ve been working on it all week and I hope it gives you some inspiration to head into the weekend! Whoo hoo, lazy outfits! 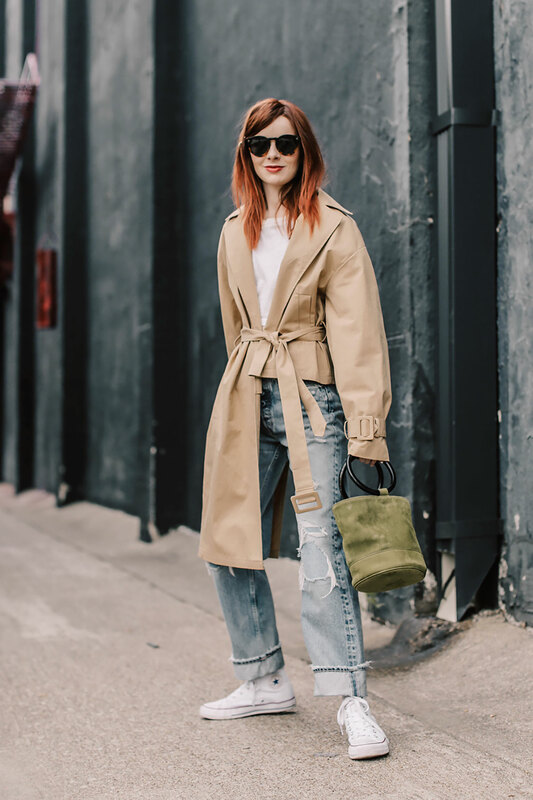 There have been updated twists on the classic trench all over the runways the last few seasons, which is awesome because that is a look that translates really well to real life! It’s hard to go wrong styling a great coat like this, but worn with your favorite lived-in denim and white sneaks on the weekend, it’s a no-brainer. These Moussy jeans I’m wearing are my current favorite lazy day denim. 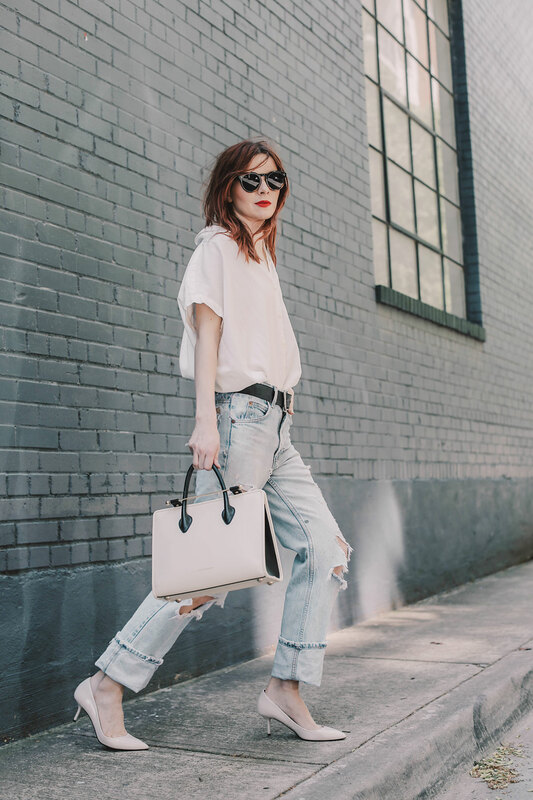 A fail-proof, keep-it-simple look is great denim paired with a white shirt and pumps. I love this blouse I just got from Madewell, I have been wearing it with just about everything lately. A low heeled white pump feels very of-the-moment and is comfortable enough for weekend wear. A pair of super high waisted boy-fit jeans pair really well with breezy cropped tops thanks to the extra tummy coverage. I am wearing a vintage Michaele Vollbracht Sport top here with 1940s vintage jeans and Premiata sneakers. This look was my weekend uniform when I was doing barre all of the time. I still love to wear this outfit for a chic errand running look. I got my inspiration for it from Sarah Jessica Parker, who wears Swedish Hasbeens with boyfriend jeans constantly. They are really comfortable and have a definite Jane Birkin vibe when you wear them with denim. The bodysuit I am wearing is just a Capezio leotard, they are cheap and they look really sleek with just about anything you pair them with! Furry sandals have been trending for awhile now and I am always hesitant to buy into a trend, but after I snagged these sandals on sale I must admit I am in love. They are so cute to wear on the weekends and I love how they look with my favorite boyfriend jeans. 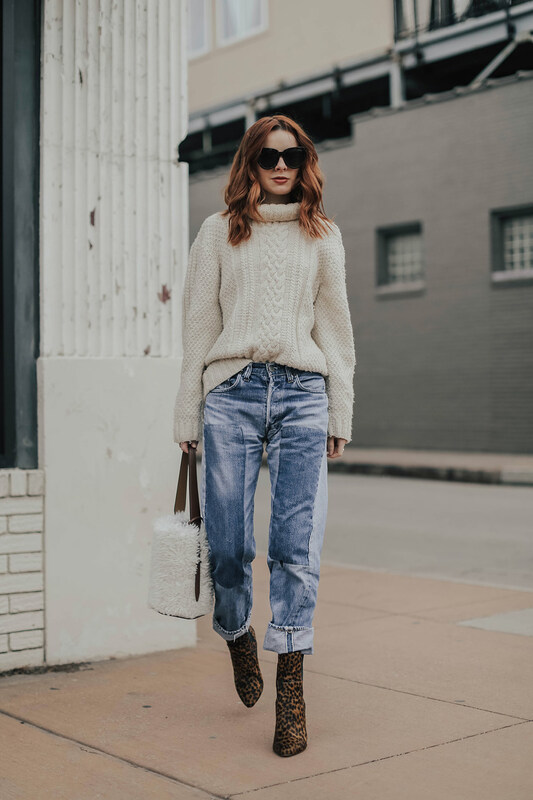 A sloppy sweater plus cuffed jeans and furry sandals makes a cozy weekend look extremely cute. Sweater weather should be behind us by now (at least here in Texas), but it isn’t. It is going to be in the forties this weekend. I am grateful for a little bit more sweater weather because nothing is as soothing as a cable knit turtleneck on a cloudy Sunday. I absolutely love wearing mine with boyfriend jeans. When I first posted this outfit a few months ago, I was swarmed with questions about these jeans. I regret to say that they are vintage, and I’ve had them since I was 15 and I recently rediscovered them at my mom’s house. This sweater is a very old one I got in Mexico years ago, but Rebecca Taylor has a similar one on sale right now that is dreamy. I love using denim as a backdrop for my latest vintage finds. This formula is fail-proof for me if I don’t know how to wear something a bit wild. 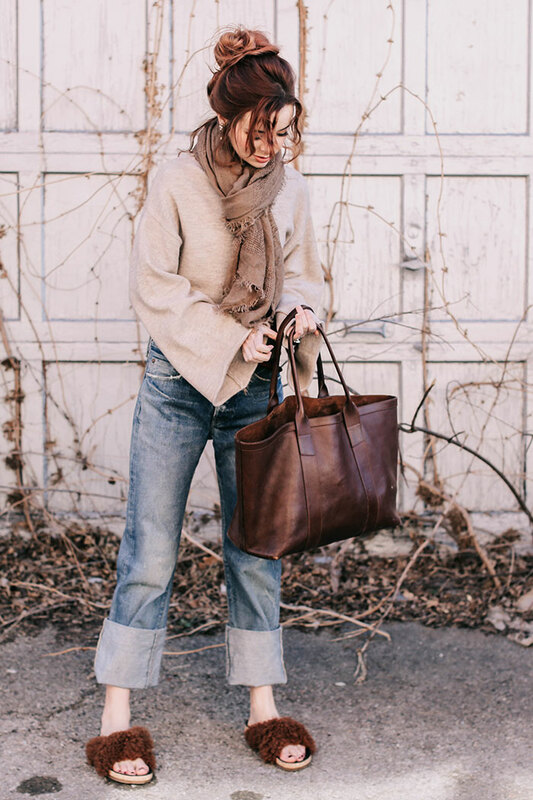 Snug light wash jeans always modernize my favorite vintage pieces. These jeans are the Levi’s 501 skinnies, a great fit for a reasonable price. The raw hem is perfect if you want to cuff them to show off your shoes. Many of the jeans I am wearing in this post are vintage jeans I’ve collected over the last ten years. I have so many vintage Levi’s, I had to buy extra storage for them. 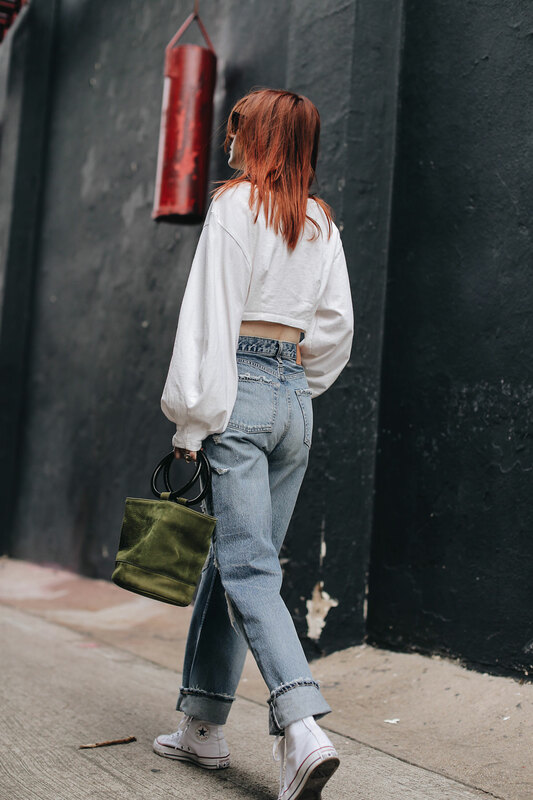 The perfect pair of vintage jeans are very elusive and hard to find and I’m not even sure I’ve found mine yet. I recently had to prune my vintage denim collection of all of the ill-fitting oversized jeans I own that I bought because I loved the wash. I find a lot of mine in vintage stores, like Dolly Python or Feathers Vintage, and sometimes I find them at the thrift store. If you want the truly authentic vintage jeans, I really like what Denim Refinery has to offer. There are many new companies that have tried to replicate the covetable look of vintage denim. Most of these have been a miss for me, the fit is off or the washes look fake/cheesy. I have a few brands that I do love for perfect “vintage look” denim, and it comes as no surprise that they are both Japanese brands. Moussy and Chimala are my top choices for the best in denim. I just bought a pair of Moussy jeans that are honest to god the cutest jeans in my closet right now, I am wearing them above. The Moussy fit is amazing, the denim is rigid like true vintage, and the washes look authentically vintage. I want to buy every single pair. You can find Moussy on Shopbop and Revolve. A word to the wise, you might want to take one size above your regular size. I’m a size 24 and I’m wearing the size 25 in the above photo. Yes, they are expensive, but you’d be hard pressed to find a similarly authentic look in my opinion. I’ve spent so many years looking for the perfect jeans and these are the closest I’ve come. Chimala also does amazing workwear inspired denim, but they are really hard to fin now. TenOverSix sometimes has them in store, and Madewell used to carry them but no longer do. I just found out that Garmentory sells Chimala, so try there if you are interested. Sometimes I find them on eBay, but unfortunately for me the sizing runs large and the largest size they offer is a size 25, so keep that in mind if you are petite! Above I am wearing two different pairs of Chimala jeans. 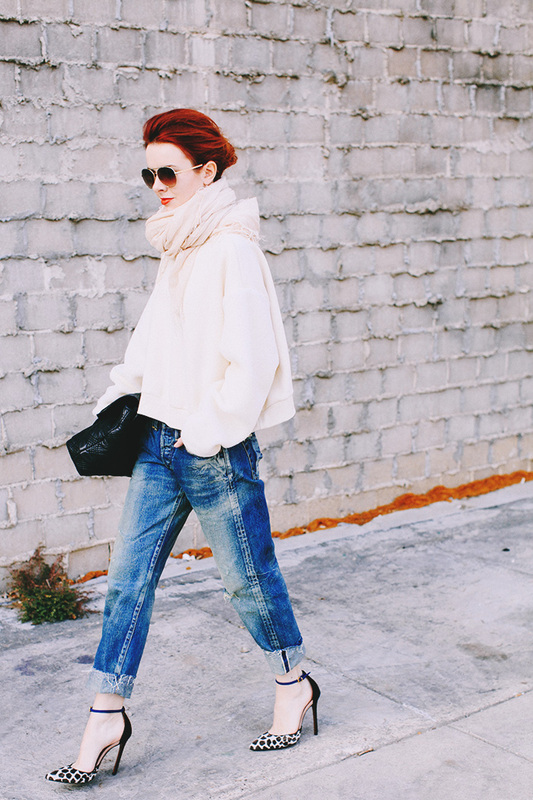 Jeans are so easy to wear and can be such a great basic or statement piece. I love all the different ways you wore them in your post! Especially the one with the sweater. Casual vibes are the best. You’re so kind. Thank you so much!! Amazing outfits and great ideas to style denim! Best jeans post in ages! Love your style. What’s the story on the cut off trench? It’s amazing! Thanks for such fab inspiration . Thank you so much!! I purchased the jacket from Style Nanda a couple of years ago. It’s one of my faves for sure. Perfect for Spring. You look totally great with many inspirations for using same jeans!! Love all of the ways you styled denim! Especially obsessed with the look featuring the fuzzy sandals! So fun! Thank you *so much* for putting this together!! I can’t wait to get started on my summer vintage denim search here in NYC! Hi Jane! Love your style (and wish your Mom would return to making fashion posts!) 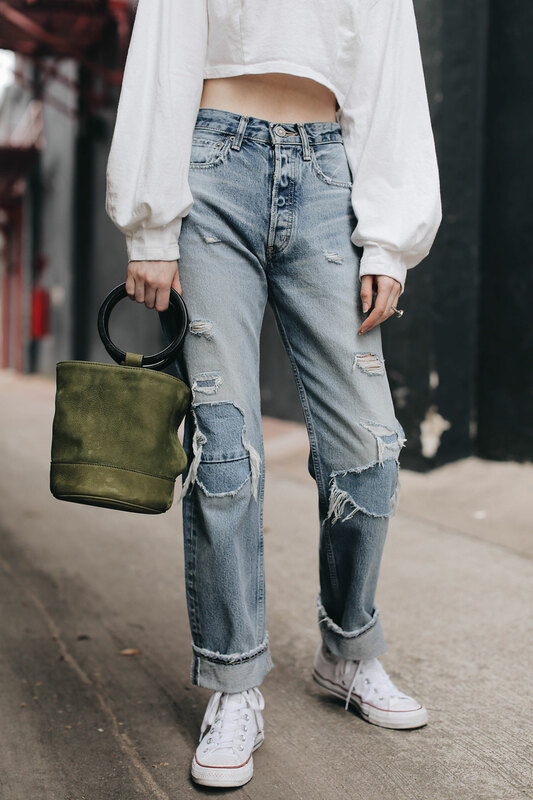 Great jean post – are your fuzzy sandals the Chloe ones? I think they’re still on sale at NM. Also love your food blog – the veggie curry recipe a few weeks back was AMAZING. We appreciate the kind words on Thyme & Temp and the curry. We really love it so it’s great when others report back on their thoughts and experiences. 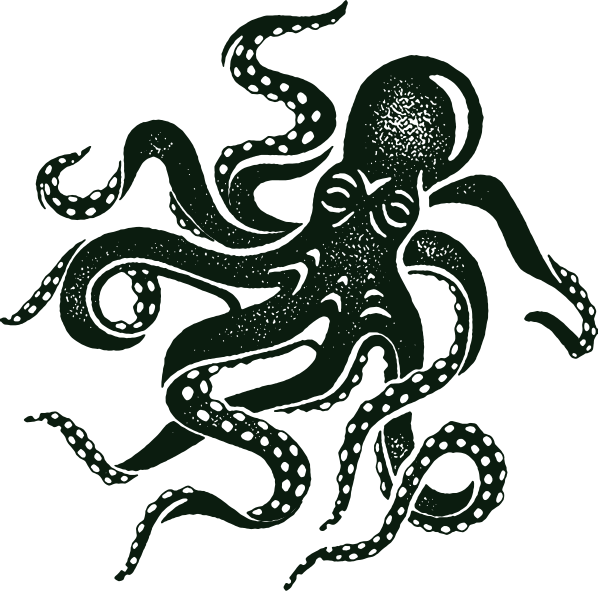 Thank you for checking it out! Great collection. I liked the denim with crop top one. You’re fabulous. This outfit is so great!